When a consumer enters into any kind of a credit contract whether it is borrowing money in the form of a loan, credit card, or financing for a car they will receive a contract with full terms and conditions. Most people will never read the contract thoroughly or check all of the clauses. Common consumer perception is that they will be treated fairly by the company that is offering the credit and this is partly enforced by the Consumer Credit Act. The Consumer Credit Act was introduced in 1974 with the main purpose of regulating credit agreements between customers and companies that offered credit. This legislation offers protection between customers and companies, mainly to make sure that customers are not taken advantage of by disreputable companies. The Consumer Credit Act has set in place a number of requirements that credit companies have to follow, such as obtaining licences from the Office of Fair Trading before trading. The advantages of this Act are fairer terms and conditions, consumer protection, and a more competitive marketplace. The legal right to be informed of all of the credit contract’s terms and conditions. The lender must make the consumer aware of the annual percentage rate that is to be charged. Consumers do have the right to question bills and penalties. Lenders must notify consumers if any changes to payments are to be made. Lenders must notify consumers of any penalty charges and the terms of these charges. Lenders must also make it known if there are any penalties for early repayment of the credit offered. Lenders cannot apply compulsory payment protection schemes. Lenders must also make consumers aware on their rights regarding secured loans on property. This is by no means a definitive list, and each lender will have their own set of terms and conditions within their credit contracts. However these are common rights and with any credit contract there cannot be terms and conditions that overrule a consumers rights. If there are such conditions in place then the contract may be unenforceable if a dispute reaches a court of law. If a consumer does eventually get round to reading their credit contracts it is usually the case that they have some form of grievance with the company. Leaving the reading of the terms and conditions of a contract until a dispute has arisen is never a good idea. Regardless of the type of contract, the terms and conditions should always be read before the contract is signed. There may be clauses in the contract that are unfair to the consumer. Although these clauses may be unenforceable by the credit company, reading and disputing these conditions prior to signing may save a lot of time and money in the long run. Credit is the number one reason for debt in Britain. Although there are rules and regulations set out regarding exorbitant credit interest rates, the practice does still go on. Many companies will use the consumer’s ignorance of their rights in order to take advantage and to simply make as much money as they can from them. There are numerous legal high street lenders who charge sky high interest rates, and these are usually aimed at people who cannot receive credit through any other route. Unfair credit contracts will have terms and conditions that are unfairly balanced in the lender’s favour. The conditions may seem unclear or ambiguous, and it is a legal requirement that all terms are clearly defined and understandable. If a consumer has any doubts on the terms and conditions of any credit contract they should clarify these with the lender before signing. All credit contracts must be entered into with the willing agreement of both parties and any duress or influence used may make the contract unenforceable. Consumers do need to take more personal financial responsibility when applying for credit. 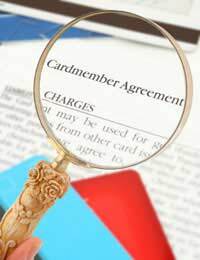 Credit contracts should be read thoroughly including all of the terms and conditions. Pleading ignorance of the terms and conditions may not bear much weight if a dispute reaches a court of law. If a consumer is unsure of any of the clauses then they should never sign until clarification has been made and agreed upon.